Training participants and facilitators. Photo source: I-TECH Ukraine. The International Training and Education Center for Health (I-TECH) Ukraine, in partnership with the Ukrainian Family Medicine Training Center of Bogomolets National Medical University, conducted a three-day training course for clinical educators on principles and innovative methods for effective teaching. 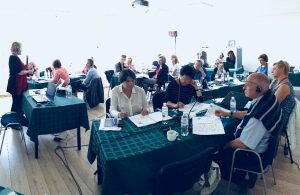 The course was held outside Kyiv from 18-20 September 2018. Facilitating the training were Ann Downer, EdD, I-TECH Executive Director and Professor in the University of Washington Department of Global Health, and Michael Reyes, MD, MPH, I-TECH co-founder and Professor in the University of California, San Francisco Department of Family and Community Medicine. revise lectures to make them more interactive. Ann Downer, I-TECH Executive Director, conducts a session, “Competencies, Learning Objectives, and Domains of Learning,” on the first day of the training. Photo source: I-TECH Ukraine. The course modeled these objectives by using small group work and other teaching methods to increase engagement. 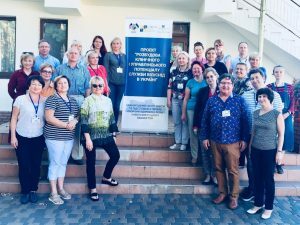 “Over the course of three days, I was able to learn techniques and best practices to actively engage my course participants into the learning process,” says Galyna Vynogradova, Associate Professor of the Ukrainian Family Medicine Training Center and participant of the training. This training course is a part of a larger I-TECH effort to build the clinical and managerial capacity of HIV/AIDS service providers throughout Ukraine.